If you’ve been thinking about DIY rat removal, you may want to think again. As you can see, rats created quite a mess in this garage, chewing through storage cabinets, nesting and leaving droppings and filth everywhere. Instead of calling a reliable rat trapping and mouse trapping service, these homeowners decided to go it alone. That was their first mistake. Rat trapping, and to a similar extent, mouse trapping is never a good idea. Use the wrong kind of bait and you’ve got dead animals in your wall. User the wrong trap and you may be confronted with an injured or aggressive, disease-ridden animal that bites and scratches! Their second DIY rat removal mistake was worse. These homeowners went to the hardware store and bought rat poison, which they spread all over the garage. There’s a number of reasons you shouldn’t use rat poison on your own. First, rat poison is toxic to humans. Children can get into it and get sick, even die. Second, pets like bait just as much as rats do, and they can easily be poisoned by accident. Finally, handling poisoned bait without proper procedures can lead you to accidentally poison yourself! Put these two mistakes together and you could have a potential disaster on your hands. 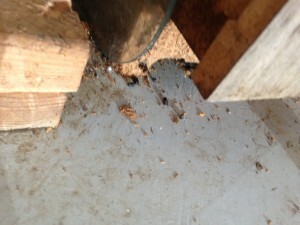 Please call a professional service at the first sign of rat or mouse damage in or around your home. Our service people are fully trained in the proper use of humane traps for rat and mice trapping. We can also help you find out where they’re getting in, seal up their points of entry and keep them from coming back. Rat and mice trapping is easy for us and safer for you and your family. Don’t hesitate to call us for a free consultation!